Ironically, this oft-despised tree, in the Fabaceae (Pea Family) is a potent mood elevator and a boon to my medicine chest for depression, anxiety, grief, and PRODUCTIVITY. The flowers have a saccharine sweet flavor and are a disgustingly spunky looking cotton-candy-colored-paintbrush-powder-puff, how could anyone hate them? Honestly, its because they are just too darn happy looking. (They are also completely taking over our roadsides and waste places.) Mimosa catches you off guard; it really is that happy! In Traditional Chinese Medicine Mimosa is called the “collective happiness tree." Perhaps Albizzia is invading our waste places because we need more euphoria in our existence. As soon as Mimosa's sweetness comes into your life you tilt your head and begin thinking of all the things you have to be grateful for and a little smirk appress to your face, your breath deepens, shoulders relax, and the truly important things become a little more clear and a lot less serious. I recently taught a class called Clarity through Herbal Medicine (read: shutting up the monkey mind/relaxing enough to find and focus on your truth) in which we tasted 3 herbs Passionflower, Mimosa flower, and Kava-Kava. We did what is called a proving where we all take the herb discussed, spend a few minutes sitting with the herb, and then talk about our experience with it as a group. As we sat and spent some time with Mimosa this first thing I noticed was the sound of a high clear chime went off in my head and then all of the energy in my body aligned with my third eye. If this terminology weirds you out you can call it the seat of divine will or the place of our (mental) soul purpose. It was as if my gifts were clear and laid bare. The class was unanimous in our convictions, and then, a few minutes later, we were unanimously in fits of giggles. SERIOUS GIGGLES. I had given them a pretty large dose of 2 droppersfull and we were as silly as a pack of school girls. It was awesome! I most often utilize Mimosa for grief, loss, and depression with a focus on those that become bitter, jaded, and emotionally “stuck.” (4) These people are unable to connect with others or themselves and exhibit misplaced emotions (volatile anger or irritability) due to their grief or hurt (Kiva Rose). Just to be clear, Albizzia doesn’t numb people to their feelings (like the many types of anti-depressants) causing emotional constipation. In truth, no one wants to process all that nasty-ness (you know…feelings), but it is so helpful to have an ally to make the task less scary and bolster you, and Mimosa does just that. It lets you relax enough to stop fighting the discomfort, stop thinking through and trying to make sense of your emotions and just FEEL them you can pass through them much more quickly. Partners and significant others file in line behind this plant because it is a serious wingman in the premenstrual mood swing department. (2) There have been many a time that my husband has handed me my “Don’t Kill Nobody” formula when I woke up hating the world a few days before Aunt Flo arrived. Thomas Easley once joked that if Mimosa flowers were given to an airy person (you know the fairy type, who run around barefoot, singing kumbaya, and just lost their keys in a cuddle puddle but seem unfazed) they might just float away. This is corroborated by Dana Baily, and I have to agree, that when the flowers are used by themselves in moderate doses they do tend to make the person a little spacey and, I find, prone to happy daydreaming or even just peaceful sitting with the absence of thought; which is great after a long day or when meditative states are what you are going for, but not very productive. (5) When you combine the flowers with the bark you get a nice balance of happy, focused contentment that can really help those that are scattered or have feelings of disassociation. Mimosa makes me incredibly productive in small doses (5 drops to 1 dropperfull). It shuts up all that negative self-talk so that I can actually begin working on projects that I find difficult instead of telling myself that I can’t do X, Y, Z for any number of self-deprecating reasons. Albizzia can work wonders for people who have a have a hard time getting settled down to start a project (raises hand). It also works well for when you are working too hard on an issue or problem and you are making it too cerebral or are strangling it; mimosa frees up the constraints to allow creative thought to enter and mix things up. In my mind, this idea connects to one use suggested by Thomas Easley in his book The Modern Herbal Dispensatory as “poor memory due to suppressed emotions.”(6) If we have too many thoughts going on our heads it is hard to process or STORE information. So, how exactly does Albizia manage to paint the world with a broad brush of joy? Well, sadly, there aren’t many studies on its efficacy (crazy right?). One animal study found that its anti-depressive action is mediated through 5-HT1A receptors (10). Meaning it interacts with this particular receptor(A1) of serotonin. There is also some research indicating that a number of glycosides, namely liriodendron, from Albizzia are responsible for its tonic action (8). Liriodendron is also found in Eleuthero, another tonic/adaptogenic plant (9). Mimosa bark methanolic extracts, in a study looking at antioxidant activity in energy crops for livestock, was found to contain the highest amount of any of the five to scavenge free radicals (11). The active principles were quercetin derivatives. Quercetin being commonly used to work with histamine reactions. Energetics: Cooling, moistening, and slightly relaxing (1)(6). 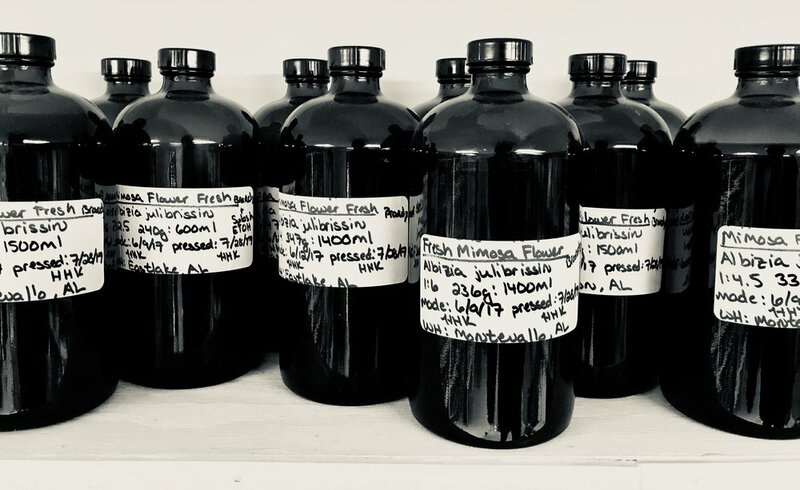 Formulating Information: Mimosa pairs well with Rose, Peach, Kava, Black Cohosh, Hawthorne, Holy Basil, Crossvine, and other mood enhancing herbals. It is used in modern Western Herbal Medicine and traditionally as an antidepressant, calmative, euphoretic, relaxant, and vulnerary. Message us to order Mimosa! Winston, David. “Little-Known Medicinal Plants of the Southeastern U.S.” Herbal Education Services, Medicines From the Earth 2013, 2013, p. 247. Winston, David. “Differential Treatment of Depression and Anxiety with Botanical and Nutritional Medicines.” 2014. Blankespoor, Juliet. “Medicinal Trees and Shrubs.” Plant Healer, Traditions in Western Herbalism Sky Island Conference 2015 Class Essays, 2015, p. 29. Bailey, Dana Tate. “Mimosa, ‘Silk Tree’, Albizia Julibrissin.” Dana Tate Bailey, 13 May 2017, southernherbalist.wordpress.com/2011/07/02/mimosa/. Easley, Thomas, and Steven H. Horne. The Modern Herbal Dispensatory: a Medicine-Making Guide. North Atlantic Books, 2016. Tierra, Michael. “Albizia: The Tree of Happiness.” East West School of Planetary Herbology, www.planetherbs.com/specific-herbs/albizia-the-tree-of-happiness.html. Higuchi, Hiroyuki, et al. “The Studies of the Leguminous Plants. Part 32. An Arrhythmic-Inducing Glycoside from Albizzia Julibrissin Durazz. IV.” Chemical & Pharmaceutical Bulletin, vol. 40, no. 3, 1992, pp. 829–831., doi:10.1248/cpb.40.829. Duke, James. “Eleutherococcus Senticosus (Araliaceae).” Dr. Duke's Phytochemical and Ethnobotanical Databases, phytochem.nal.usda.gov/phytochem/plants/show/734. Kim, J H, et al. “Antidepressant-like Effects of Albizzia Julibrissin in Mice: Involvement of the 5-HT1A Receptor System.” Pharmacology Biochemistry and Behavior, Elsevier, 6 Apr. 2007, www.sciencedirect.com/science/article/pii/S0091305707001207. Jung, Mee Jung, et al. “Phenolic Glycosides from the Stem Bark of Albizzia Julibrissin.” ChemInform, vol. 36, no. 23, July 2005, doi:10.1002/chin.200523203. Gardner, ZoeÌ, and Michael McGuffin. “American Herbal Products Association's Botanical Safety Handbook.” American Herbal Products Association's Botanical Safety Handbook, CRC Press /Taylor & Francis, 2013, pp. x-x.